Probably the BEST personal blog theme of 2018. 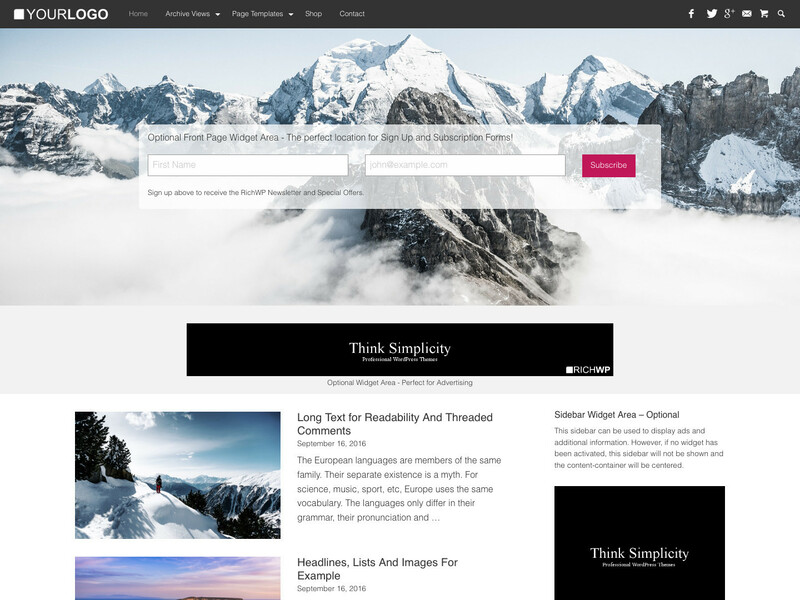 Rich Master is a WordPress theme for professional and personal blogs. Its layout is modern and the coding is lean and fast performing which makes it one of the best choices to catapult your site into blogging stardom. A FREE version is available (see below). The layout of the Rich Master WordPress theme has been developed with best practices in mind. The logo is strategically placed in the top-left position, making it the first thing your visitors will see. According to a recent study by the Nielsen Norman Group, visitors are 89% more likely to remember logos and can recall your brand when shown in the traditional top-left position than on the right. When your visitors remember, they will be more likely to come back for more and your brand value increases. Your visitors’ eyes then wanders to the right, where they will immediately find the primary navigation and get an idea about your site’s structure and what they can expect to find on your blog. The primary menu features full drop-down functionality, so you can build your sites’ structures several levels deep. On the right site of the top menu bar, you will find the icon-menu. The recognizable icons of popular social media sites as well as email or shopping cart icons invite the user to connect. Below the top menu bar, you find the optional hero or header image area. You can set a hero image for your front as well as for your shop page. For all other pages and posts, you can choose to display the feature image of the post or the page. Since this is prime website real estate, we added widget areas that can display email signup forms or special announcements right in the center of the header images. As mentioned earlier, these areas are optional. 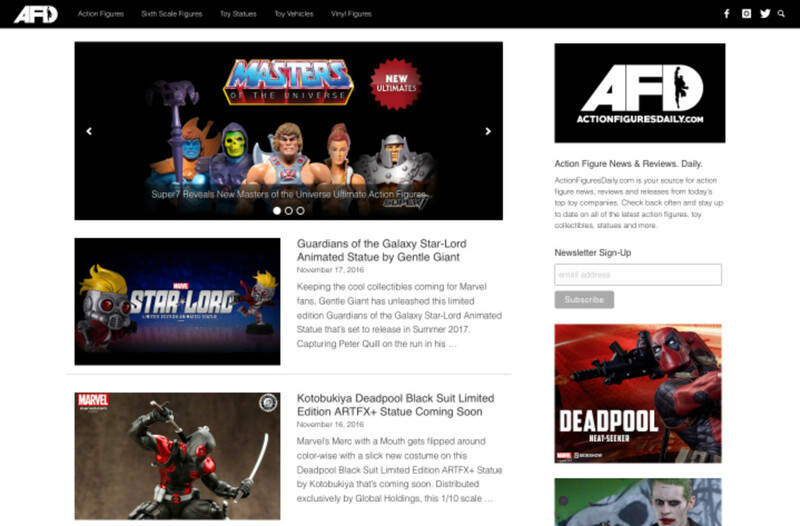 The Rich Master theme features a classic blog-styled layout with the post listings or content area on the left and a sidebar on the right. This emphasizes the importance of your content, since the same principle regarding the placement of the logo also applies here. The left site of a website is the first area that visitors focus on. Should you decide against having a sidebar, the content container will be centered. These are two proven and time-tested blog designs and one of the reasons this theme is called the Rich Master Theme. Besides the sidebar, we added several widget areas throughout the theme so you can easily display additional information or add advertising in the right places. They have all been enabled in the demo, so take a look. Resize the browser window to get an idea of how the theme scales to smaller devices. 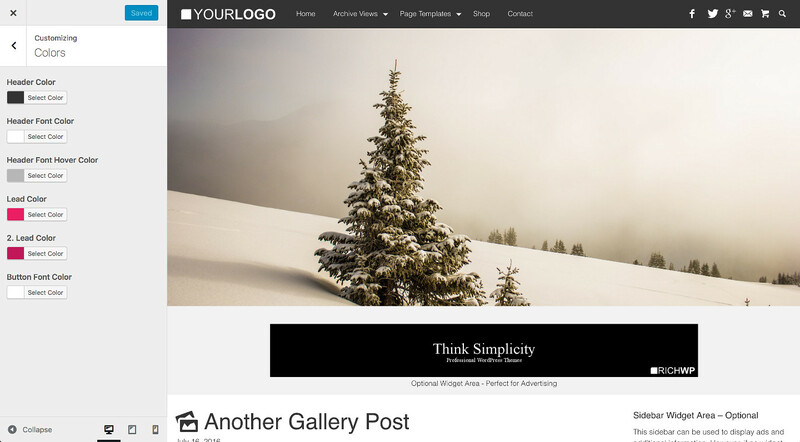 This theme features a classical but contemporary design that has been specifically created for blogging. Since you can blog about pretty much anything, the Rich Master design has to be flexible. It does live of the top bar background color that you choose, the logo style you upload and the images you use, whether it be for the header or feature images. The typography has been set for pixel perfect readability and every element has been crafted with a love for detail. Everything comes together beautifully and will leave a long lasting impression on your visitors. The Rich Master theme is easy to install and set up. Just upload and activate it, set up your menus, and you are ready to go. Sure, you will likely want to change the lead colors like the top bar background and the buttons, upload your own logo, and add content to the widget areas, but the theme makes it easy to do so right from the theme customizer. By using native WordPress functionality that you already use and understand, this theme is as simple as it gets while providing maximum flexibility. No website using the Rich Master theme will look the same. Another important reason to use a theme that uses only native WordPress functionality and never interferes with your content is that your site will be update-proof. If you keep the design and content separate, updating your design only requires you to upload and activate a new theme. We call it “Professional Simplicity” for a reason! 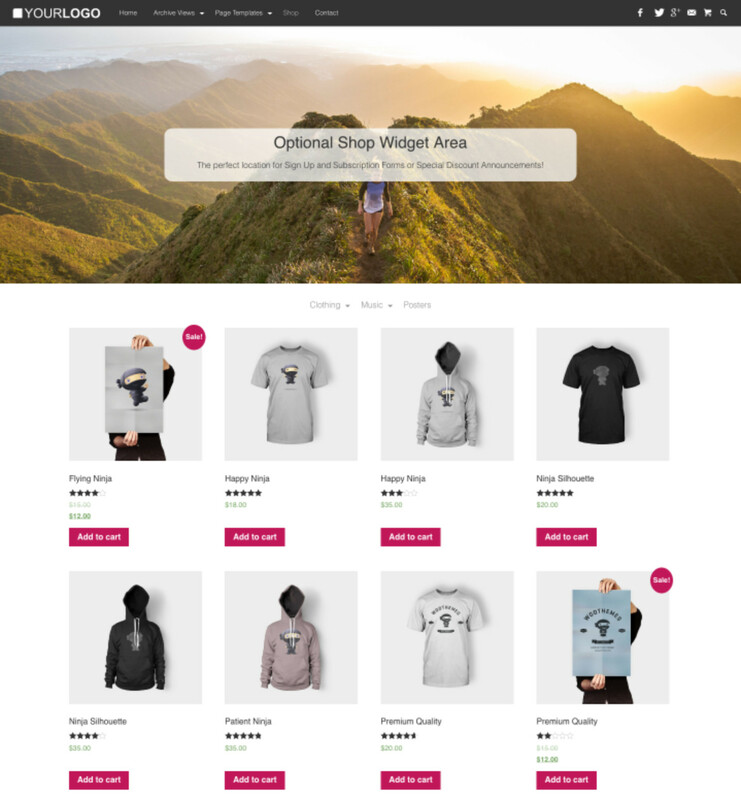 The Rich Master theme is WooCommerce compatible (see demo shop). If you are considering running a shop right next to your blog, this is the theme to use. Your blog posts will bring in visitors and the power of WooCommerce will turn them into customers. It is the perfect turnkey content marketing meets my shop strategy. Let’s get a bit more technical. The Rich Master Theme has been built on Zurbs’ fantastic Foundation front-end framework. They claim that it is the most advanced front-end framework in the world and they have the right to do so! The code is lean and optimized, and your site will be mobile first, fully responsive, and work in all modern browsers. It will look great everywhere from small smartphone screens to tablets all the way to large desktop screens. Combine the power of their Foundation front-end framework with our decade of experience in WordPress theme development and you can be assured that the security of this theme is airtight and that search engine bots know exactly how and where to analyze your site content to get an edge over the competition. We just recently helped Mike over at Action Figures Daily switch to the Rich Master theme. Mike is a seasoned affiliate marketing pro covering a diverse range of industries. We at RichWP are proud to know that he has put his trust into our products and services since 2009. I like his idea of including a responsive slider at the top. If you want to start a new blog or relaunch an existing one to freshen up its look and feel, the Rich Master WordPress theme is the right choice. It is the ideal solution for working with a WordPress theme that needs a bare minimum to get up and running in no time at all, and since it uses native WordPress functionality, you already know how to use it to its fullest. We are available and eager to answer your support questions, provide advice, or offer solutions directly via email or chat. If you want a partner with over a decade of WordPress experience, RichWP is what you are looking for. Head over to our feedback page to see what our customers think about our products and services. Otherwise, jump right in, the Rich Master Theme is the ideal choice for taking your blog to a professional level. Installing the Rich Master Theme is as easy as it gets. Check the Installation & Setup Guide no need to break into a sweat. Get your site elevated with the Rich Master Theme today. Your success will be accelerated. It′s your turn to make headway!